Disney's Animal Kingdom Gold, Silver, and Bronze Olympics! Yesterday we took a look at the Gold, Silver, and Bronze winners at Epcot, and today we are looking at the same thing at Disney’s Animal Kingdom. Thursday we’ll complete this mini-series by looking at our Gold, Silver, and Bronze winners at Disney’s Hollywood Studios. Is there any doubt that this would be my Gold Medal winner? 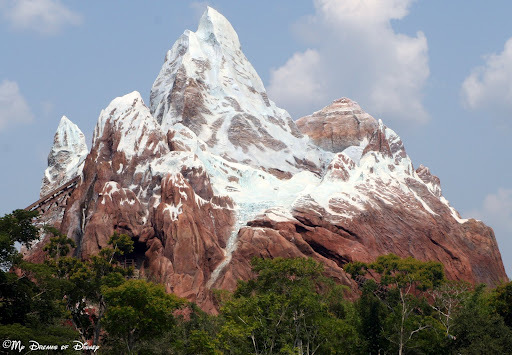 I have become such a big fan of Expedition Everest that I take advantage of riding it as many times as I can! The roller coaster is incredible, but for me, even better is being able to get in the Single Rider line. We did that during our last trip, and despite the fact that the stand-by line was 65 minutes, we were on the roller coaster in under 15 minutes! As for the coaster itself, it is a lot of fun. My favorite part is when we are going backwards, it never fails to make my stomach lurch just a little bit, but it’s fun nonetheless! When it comes to my Silver Medal, Finding Nemo — The Musical has my vote. This long running show in Dinoland, U.S.A. is one of the best shows at Walt Disney World, and is a great way to spend some time indoors during the heat of a hot Florida summer day. The actors that portray the different characters in the show do an exceptional job of bringing those puppets to life, and telling the story of Nemo and Marlin in a way that is compacted, yet still captures the essence of the movie. Finding Nemo — The Musical is a favorite of ours, and we strive to see it every chance we can. Not all of my medal choices have to do with rides or shows or fireworks; some of them just come down to experiences. For my Bronze Medal winner, I’m sharing with you my picture of Sophie eating a Jumbo Turkey Leg that we purchased at the Trilo Bites while some of the others were on Kali River Rapids. The picture to the left shows just how much Sophie liked that turkey leg, and how big it was in comparison to her face! We don’t eat a turkey leg every trip to Disney, but we do eat them every now and again, and when we do, we certainly enjoy every bit of them! Now, like always, I’ve got the Gold, Silver, and Bronze picks for Cindy and Sophie. Check back in on Thursday as we conclude our series by looking at the Gold, Silver, and Bronze winners for Disney’s Hollywood Studios! What are your favorites here at Animal Kingdom? How about leaving a comment and let us know? Thanks! Running the rapids on Kali River Rapids! Previous Post: Epcot’s Gold, Silver, and Bronze Olympics!